About 100 people were at the York Civic Centre tonight to hear the candidates speak. Ahmed Hussen, the Liberal candidate, declined the invitation to attend. 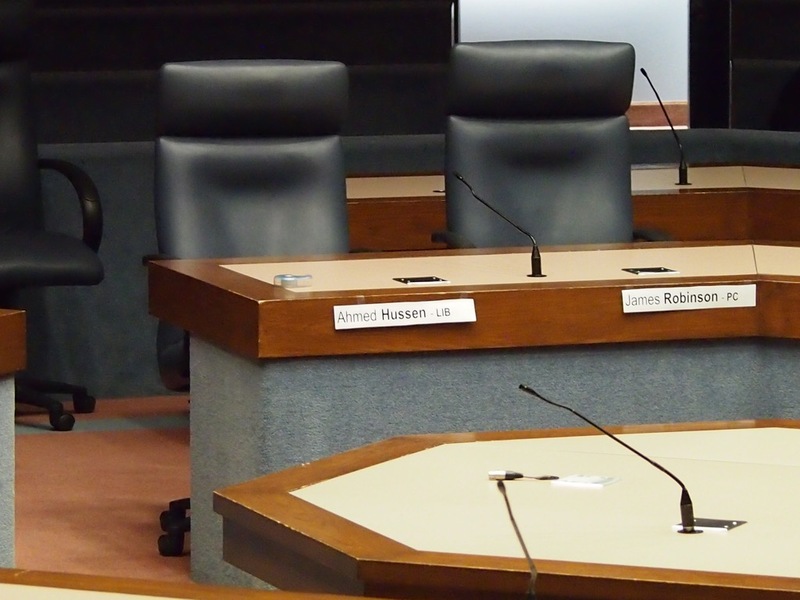 The Conservative candidate, James Robinson, who nobody expected to show up, fufilled those low expectations. The debate was an exceedingly cordial affair; far from sparring, John Johnson and Mike Sullivan seemed to support each other. Johnson made no concerted effort to separate himself from the other left-leaning candidate, and once or twice Sullivan reached out, both figuratively and literally, to the man beside him. There was some laughing and no jabbing. Sullivan was polished and stuck to the party platform: pro-transit, anti-war, pro-niqab, anti-Conservative and pro-environment (with the disappointing exception of pipelines). He was genuine though, and he was relaxed and charming. He seemed most passionate when speaking about Weston and his decision to run here. Johnson may have been a bit less polished and a little less schooled in the doctrines of the Greens. He never had the inclination (or the occasion) to bang the table, and seemed content to answer questions with his own ideas and to improvise. I respect him very much for putting himself forward. I do regret, however, that he did not hold Sullivan more to account. Of course, that is not really his job. He is a fringe candidate. The other parties–and especially the Liberals–should have been here, testing their own ideas and those of their opponents. And in this, they have let us down. No. That doesn’t do this situation justice. Allow me to take off my thin veneer of objectivity and put it aside for a moment. Ahmed Hussen and James Robinson want the fame, feeling, and fortune of political candidacy, but they do not deserve a vote, let alone a job. They refuse to stand before you and your neighbours and answer your questions. They refuse to explain. They will not say how their party’s platforms will affect you and your riding. You wouldn’t hire a plumber who wouldn’t meet you, but this is much worse. Politics is war by other means. It makes winners and losers, and Hussen and Robinson owe it to you to explain their doctrines—after all, you might be one of the losers. They should have the guts. Worse, much worse, they missed their chance to challenge the incumbent, Mike Sullivan. They would not face him, test him, and hold him and his record to account. Even if they think they will lose (and they are ensuring that) they owe us their expertise. Democracy, like capitalism, works only with competition. Gerrymandering and vote suppression are evil because they prevent that battle of ideas. Refusing to engage your opponent is no better: it makes a clash of ideas into a contest of advertising. So shame on these gutless cowards who want much and give little. Shame on Ahmed Hussen, in particular, whose put himself forward in a competitive riding and refused to compete. Ahmed Hussen did York South–Weston a terrible disservice. He asked to be elected but not accountable, and, worse, he abetted Mike Sullivan in being the same. ¹ The 12 Community Alliance, the Rockcliffe-Smythe Community Association, The Weston Village Residents’ Association, the Mount Dennis Community Association, and the Greenhills Community Association deserve your thanks and support. The Conservative Party of Canada has put James Robinson forward as its next candidate in York South—Weston. It seems that the party has abandoned any pretense that they might actually win. Whether fighting for the disenfrachised [sic] or mentoring our leaders of tomorrow, James Robinson is the right choice for York South-[sic]Weston …. James is a long time [sic] advocate for all the people of York South-Weston, tirelessly working for all citizens no matter what concerns them or what effects [sic] York South-Weston. James has worked intensely with youth and has counseled [sic] many residents on a broad range of subjects and problems, always treating people with the respect they deserve. The party cannot, it seems, afford a copy editor (to advocate for longer time is an unusual position even for the PCs, and, really, could they not put forward someone who can spell the name of the riding right? It’s an em-dash, not two hyphens, and certainly not one). Nor is a photographer or web designer within reach—the most prominent part of the page is a photograph of of the candidate’s forehead. Your humble correspondent has not heard of Robinson, perhaps because Robinson lives in Whitby. I’m not saying that the bit about him being a local advocate is untrue—I have no parliamentary privilege, after all—but I will say that I’ve been paying pretty close attention riding news for close to five years, and we’ve not yet crossed paths. 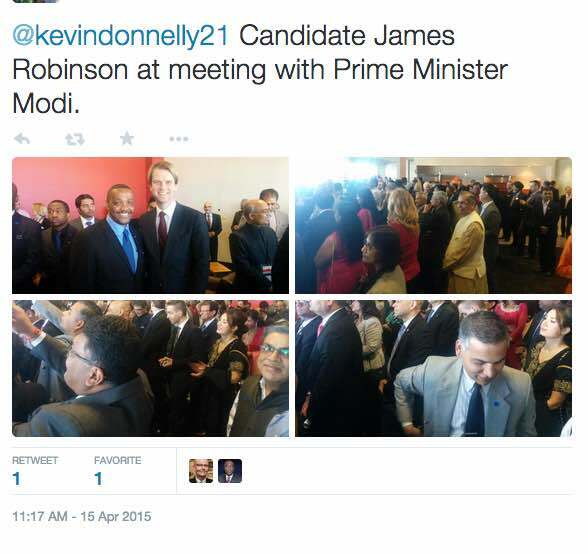 The riding association also posted some pictures of him that said he was at a meeting Indian Prime Minister Modi, the effect of which was to show just how far Robinson was from actually meeting him. There are lots of pictures of hands, crowds, and people who are emphatically not Modi. YHC is not pleased. I am allergic to every political party, and the Conservatives give me anaphylaxis. But I am doubly displeased by lame- duck, half-assed efforts. The Conservative candidate in the last election did not even campaign. The sum of her efforts was to put a sign on an abandoned house on Weston Road. She did not even collect the sign, and it remains. This does us all a disservice. It wastes time, and money, and votes. But those are nearly irrelevant compared to the true cost: accountability. Conservatives are not (always) fools, so when they do not mount a credible candidate we all lose the chance to hear our aspiring leaders held to account from the perspective of the right. Should you wish to meet the aspirant in person, James Robinson will be having a meet and greet on April 24 at 30 Gordon MacKay Rd. He will address the audience at 8 pm. Conservatives and Liberals are attacking the NDP MPs, including Mike Sullivan, for misusing their community offices as staging grounds for political events such as door-to-door blitzes. This would violate the rules about spending government money. But at least one NDP MP has used his constituency office as a gathering place for a more overtly partisan event. Mike Sullivan used his Toronto office earlier this month to gather supporters for a bus ride to a downtown rally with NDP Leader Tom Mulcair. And that is the nub of the issue. Was Mulcair’s rally an election rally? This past Sunday, Thomas Mulcair spoke to our wonderful city of Toronto. His message was one of hope not fear and optimism not despair…. It’s time to build a more progressive and generous Canada. In the next election say no to the same old kind of politics, turn away from the talking points of cynicism and negativity, and vote for the change you want – and actually get it. My constituency office was not used for partisan purposes – it happened to be a convenient location for folks to meet before getting on a bus, near parking and 11 bus routes. As far as I know, the freedom to assemble is still in the Charter of Rights & Freedoms. It is true; we still have the right to assemble. Next time, though, Sullivan supporters might consider exercising those rights in the Tim Horton’s just down the street. Author Adam NormanPosted on February 14, 2015 Categories Politics, TrainsTags CN, CN Rail, CN tracks in Weston, Mike Sullivan, weston, YSW1 Comment on Sullivan calls for rail safety. The Conservatives lie.